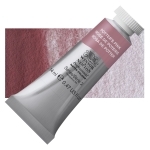 Chrome tin pink sphene comprises a mixture of silicates and metal oxide salts. The opacity of the formulation depends on the proportions of these salts. Tinting strength is low compared with most organic pigments. The inorganic metal salts in this pigment are extremely stable. Chrome tin pink sphene comprises a mixture of silicates and metal oxide salts. Although none are known to be carcinogenic or toxic, fine particles of such materials are respiratory and eye irritants. Contact with dust should be avoided. This inorganic pigment has been used in enamels and ceramic glazes. Naturally occurring mineral deposits have been used in ceramic glazes for centuries.